Compact Lightweight and Large Payload: net weight is only 970g, and max. payload is up to 3kg, the lightweight and compact body makes it easier for run-and-gun shooting. Versatile and Ergonomic Structure: you can easily enter a handy sling mode by mounting the included mini tripod as a handgrip. 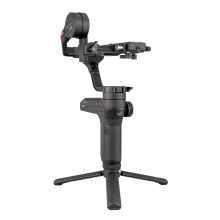 filming has never been so easy and flexible. ViaTouch Control System: enables users to take care of every detail simply on a phone screen. You can make various gimbal movements and camera setting while framing the shots simultaneously all via a same screen. And it is much easier to take a selfie with the ViaTouch control system. PhoneGo Mode to Unleash Full Potential: The PhoneGo mode empowers the gimbal to its maximum follow speed and helps to capture the object precisely. Just a single tap on the Go button, your camera is ready to handle extreme sports scene. Motion Sensor Control: allows a direct connection to your phone and turns it into a motion sensor controller. By simply moving your phone, you are controlling the gimbal in real time. Automated Advanced Features: supports various advanced features via ZY PLAY such as panorama, focus timelapse, motion timelapse, long exposure timelapse, etc. And wireless HD image transmission supports real-time monitor, framing and parameter control over your camera. The camera, smartphone, phone holder showed in the picture are not included.